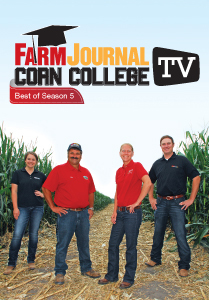 Head to the field with Farm Journal Field Agronomists Ken Ferrie and Missy Bauer and learn the best corn production strategies and tips as seen on Corn College TV: Season 5. You'll be sure to watch this DVD multiple times, as it will soon become your "go to" resource for corn production questions. Made in the U.S.A. Ships from Cedar Falls, IA.